By CNN'S ALLIE MALLOY, DEBRA GOLDSCHMIDT AND DAN BERMAN CONTRIBUTED TO THIS REPORT. 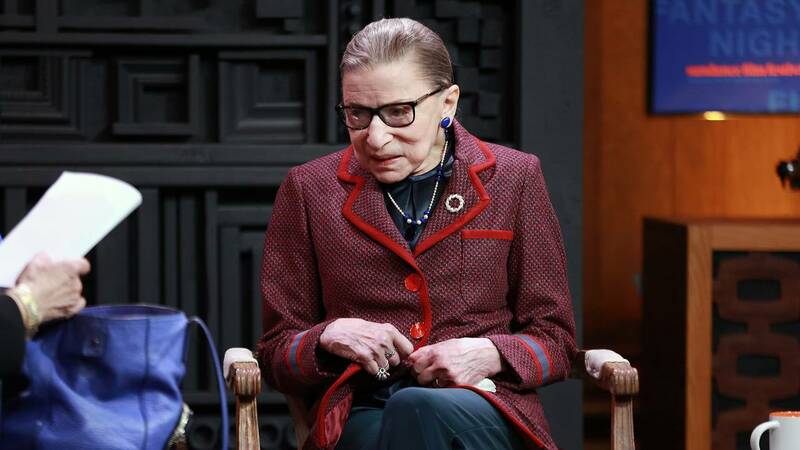 (CNN) - Justice Ruth Bader Ginsburg fractured three ribs after falling in her Supreme Court office Wednesday night, the Supreme Court said in a statement. According to the court, Ginsburg, 85, experienced discomfort after going home following the fall and was admitted to George Washington University Thursday morning for observation and treatment. Ginsburg, who became the second woman to serve on the high court following her appointment by President Bill Clinton in 1993, has become a progressive and pop culture icon. Admirers have recently nicknamed her "Notorious RBG," a play on the late rapper Notorious B.I.G., and have hailed her as a bulwark against conservative ideology -- and President Donald Trump -- because of her liberal opinions and dissents. Ginsburg was not present at Thursday's investiture of Justice Brett Kavanaugh, Trump's appointee confirmed last month that gave the court a solid 5-4 conservative majority. Ginsburg's health has become the subject of much attention in recent years. In November 2014, she underwent a heart procedure to have a stent placed in her right coronary artery, and in 2009, she was treated for early stages of pancreatic cancer. In 1999, just six years after being sworn in as an associate justice, Ginsburg successfully underwent surgery to treat colon cancer. Ginsburg said in July she hopes to stay on the bench past 2020. "I'm now 85," Ginsburg said. "My senior colleague, Justice John Paul Stevens, he stepped down when he was 90, so think I have about at least five more years." White House counselor Kellyanne Conway said Thursday that Ginsburg is "a very tough woman" and that she's "praying for her." "I've known her for many, many years -- got to see her just a few weeks ago here at the swearing-in of Justice Kavanaugh," Conway told reporters, adding, "I hope she has a full and speedy recovery." More than one in four adults age 65 and older fall each year, according to the US Centers for Disease Control and Prevention. A study published in September found that most falls are preventable and noted that they not only result in severe injuries, they are one of the most costly health conditions. In 2015, more than 28,000 people age 65 and older died as a result of fall injuries, one death every 20 minutes, the CDC says. An additional 3 million older adults sought care in an emergency department for a fall. In short, fall injuries are a serious public health problem. "The biggest issue in anyone with a rib fracture is the pain and the impact on lung function," said CNN Chief Medical Correspondent Dr. Sanjay Gupta. "All of these risks are dramatically increased in the elderly."